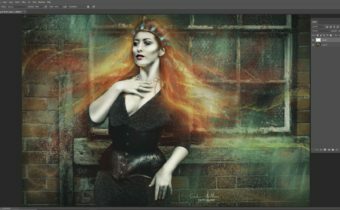 In this Photoshop tutorial Andrei shows how he put together Toward the Dark. Watch as this piece is built up using multiple images of the same model and lots of images of fabric. Then, see how the dramatic lighting is created to match existing lighting, using overlays and blend modes. These images were created by Shift Art members, based on Toward the Dark by Andrei Tallent. Join Shift Art to show your version! In this tutorial you mention that you added color to the left side after you had completed the other layers. Wouldn’t the fact that you had several intermediate stamp layers have prevent the effect on the final image? Good question. The stamped/merged layers are set to Soft Light and Screen, allowing layers below to be seen and interacted with. Excellent tutorial! I find it really great that a written version is also supplied; very helpful. Thanks for lowering the volume of the background music too 🙂 much easier to her and concentrate! Many thanks very helpful. I too appreciate the lack of background music when I am concentrating. I really appreciate having the written version of the tutorial, I find it much easier to follow than the video – I’m not always familiar with the different manipulations involved as I’m still learning how to use Photoshop. Please keep up the good work. Thanks! It is great to see that some members prefer the written version, and others the video. I like the written version too. Then I watch the video but I always go back to the written one. This was really awesome! Andrei, it is wonderful to have both a video and written tutorial. It makes understanding these techniques much easier. There was a lot to learn in this tutorial.